In September 2008, beset by mounting losses on high-risk mortgages and mortgage securities, the Federal Home Loan Mortgage Corporation teetered on the brink of insolvency. Fearing that confidence in the housing market would collapse completely if Freddie Mac and its competitor Fannie Mae failed, the US government made the difficult decision to place the two firms into conservatorship, taking control away from shareholders. Although the taxpayer commitment of hundreds of billions was meant to stabilize the housing finance system, Freddie's fall at the start of the financial crisis set off shockwaves around the world. 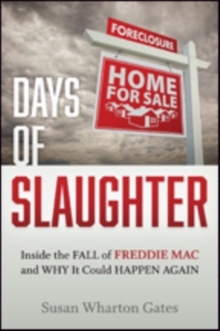 In Days of Slaughter, Susan Wharton Gates, a former 19-year Freddie Mac employee and vice president of public policy, provides a vivid eyewitness account of the competing economic and political forces that led to massive losses for shareholders, investors, homeowners-and taxpayers. With a keen eye to the policy landscape, Gates relates the fateful decisions that led to Freddie Mac's downfall and desperate rescue. She also examines today's worrisome headlines about potential future bailouts, the uneven housing recovery, and stymied congressional reform efforts. Throughout the book, Gates argues convincingly that policymakers will be unable to safely reform the massive housing finance system that currently rests squarely on taxpayer shoulders without addressing deeper issues of ideology, moral hazard, and interest group politics. The first book to tell the story of Freddie Mac from an insider perspective-while casting a prophetic eye to the future-this first-hand account of housing policies, complex financial transactions, and the crazy quilt of federal and state actors involved in the Great Recession is a must-read. A cautionary tale of failed policies and corporate mismanagement that compellingly addresses previously unexplored issues of political ideology, organizational dynamics, and ethics, Days of Slaughter will appeal to readers everywhere who want a fuller explanation of what went awry in the US housing market.